My daughter and I lived in Greece for nearly three years, in the early 1980s. This meant that we were there for three Greek Easter celebrations, which were wholly unlike an American Easter, although there was a festive meal involved, and colored eggs. In Greece, the great Easter feast was served on Sunday afternoon. Traditionally it calls for a whole roasted lamb as the main course – and roasted for most of the morning over a grill built outside in the garden. Even in the cities, this was carried out: the cover of one of the English-language magazines featured a line drawing on the cover one year, of a happy little knot of people on the top of a downtown tower block, roasting their lamb over a fire-pit on the roof, and dancing a traditional Greek line dance. One of the Easters we spent there it was miserable and rainy; but our neighbors were all out in the garden, huddled under tarps and umbrellas, grimly turning the lamb over the smoking fire. On another Easter we went to a joint ecumenical Protestant sunrise service, organized by the base chapel, a Scandinavian seaman's mission and the Church of England congregation. The service itself took place on the Areopagus Hill, where Saint Paul had preached to the Athenians; and the backdrop was of the Acropolis, temple-crowned in light and glory as the sun came up. As often as not, my daughter and I have had lamb for Easter dinner ever since, although we've never, ever been able to afford a whole lamb, or even a leg of one. Usually we settle for chops, served with a cheese pie and a village salad, which is a standard in Greece like breakfast tacos are in San Antonio. 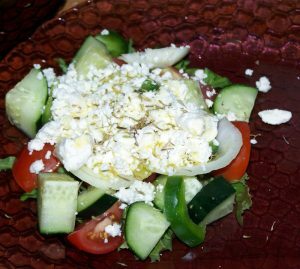 A Greek village salad is made of a fresh tomato or two, sliced or cut into pieces, and an equal amount of cucumber, topped with a few rings of fresh onion and green bell pepper, topped with a small slice of feta cheese (or a couple of tablespoons of feta crumbles) and a drizzle of olive oil, two or three olives, dried thyme and oregano. 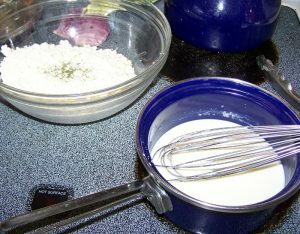 Cheese pie is a little more complicated to make, but nearly impossible to mess up.